Windows 7 – How Do I Delete Old Networks? 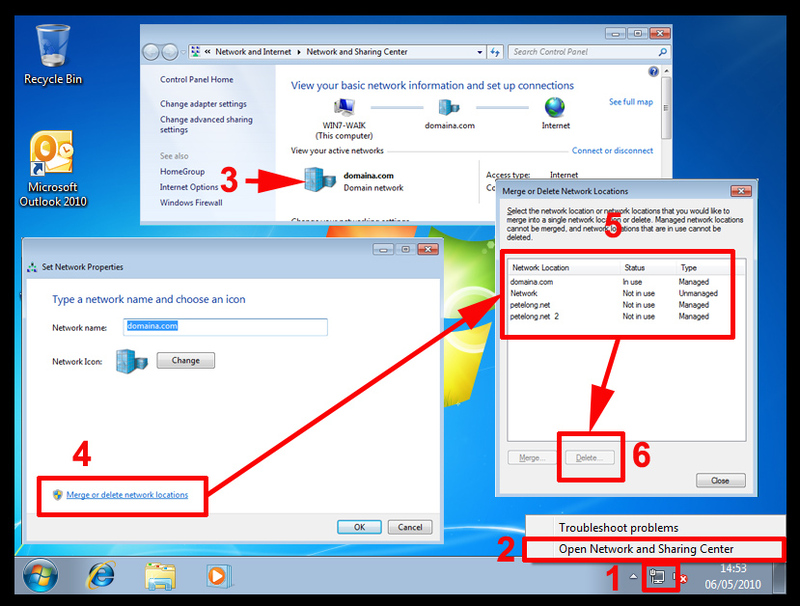 Home » Microsoft » Windows 7 – How Do I Delete Old Networks? If you move around a lot from client site to client site, your Windows 7 network list can get huge. 1. Right click the network link on your taskbar. 2. Select “Open Network and Sharing Center”. 3. Left click your current connection. 4. At the bottom of the screen select “Merge or Delete network Locations”. 5. Select the unwanted ones > Delete > Close. Note: Old networks are stored in the “HKEY_LOCAL_MACHINESOFTWAREMicrosoftWindows NTCurrentVersionNetworkListNlaCacheIntranet” Registry key.